Kristina was born in Columbia, Missouri in 1989. She earned a Bachelor of Science in Economics in 2010 and a Master of Business Administration in 2011, both from the University of Central Missouri. Before attending law school, Kristina worked in the banking and mortgage industry. She graduated from Washburn University School of Law in 2017. 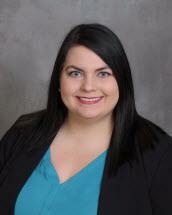 Kristina joined the firm as an associate in 2018. Kristina is admitted to practice before all courts in Kansas including the U.S. District Court for the District of Kansas. Kristina enjoys practicing in a number of different areas of law, including real estate, business, and natural resources. She has experience in transactional drafting, civil litigation, estate planning, and title examination.